It offers 8 levels of magnetic resistance for different levels of challenge and difficulty, but will feel smooth and quiet at all levels. It requires zero maintenance thanks to the magnetic resistance and smooth belt drive. As you’ll be working both your arms and legs at the same time, while being able to pedal forward and backward this is a rather versatile product. Sunny SF-E3804 weighs 81.4 pounds as a solid heavy-duty fitness product and measures 54L x 24W x 63H inches. It doesn’t have a foldable design but comes with the transport wheels at the front that make it portable and easy to move within your house. You’ll feel safe and stable on its large and textured anti-slip pedals during the most demanding workouts. And the stabilizers underneath will keep the balance. You want to have your heart rate increased to be able to burn fat faster and get the best results. Your increased heart rate needs to be longer and steadier. And with the pulse rate indicator on the display panel you’ll stay in the peak heart rate zone. 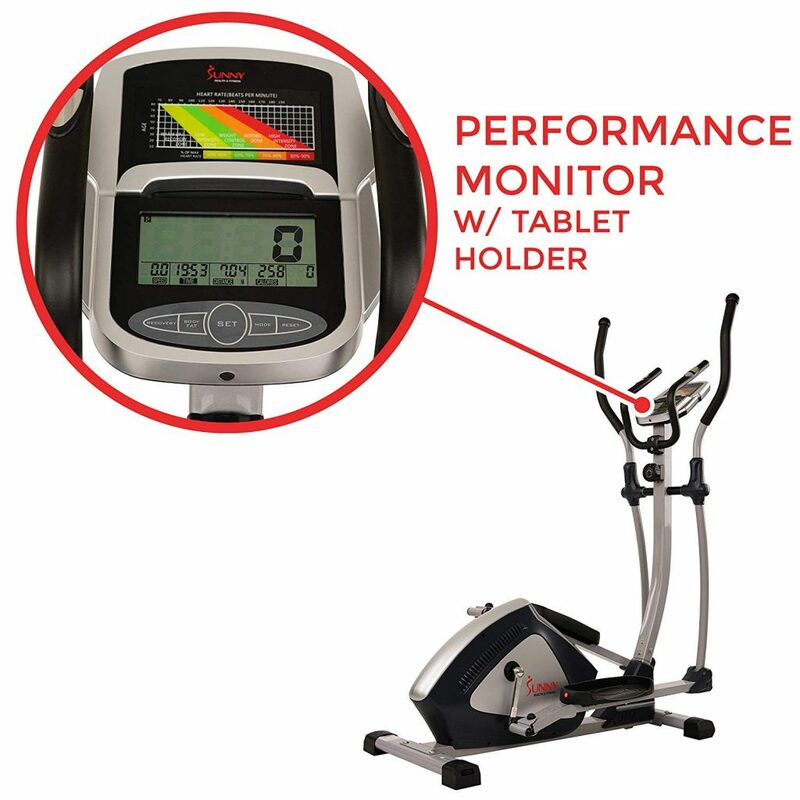 It comes with a smart and modern, easy to understand LCD monitor with the heart rate monitoring option via the handle sensors. It gives you the common stats like the distance traveled, current speed, time exercised, calories burned, rpm and pulse rate. As a sturdy and durable elliptical trainer with a heavy-duty frame it can carry a total user weight of 287 pounds. There is an integrated tablet and smartphone holder for you to watch your videos. 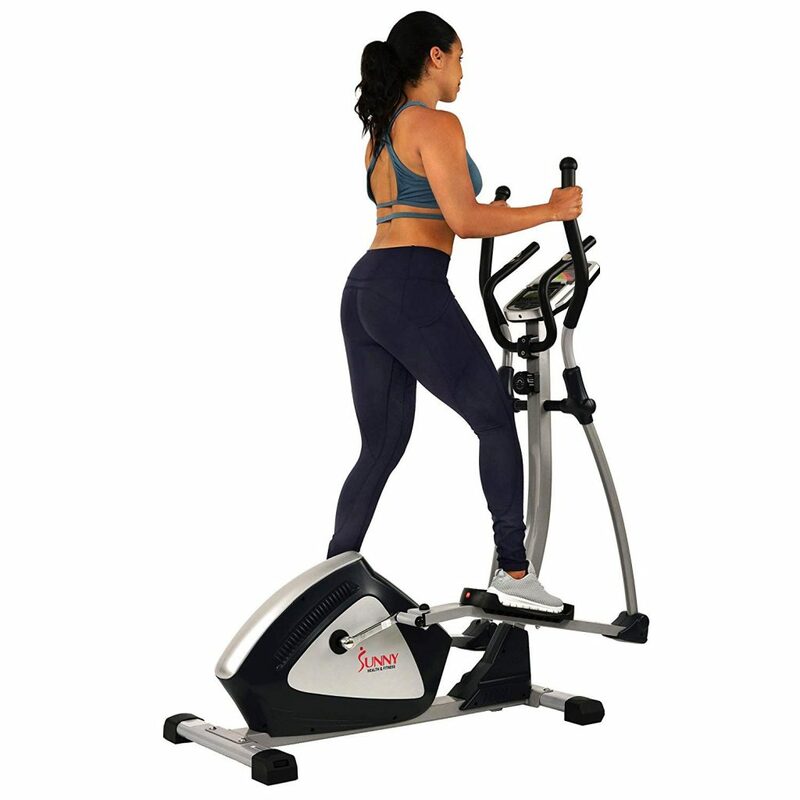 It includes two set of handles, moving and fixed, and by holding the fixed frontal handles and riding this unit, you will be engaging your hamstrings, thighs, quadriceps and glutes much better than say cycling or running on a treadmill. And when you hold and move the other full motion handles you will be working your chest- pecs, arms-triceps and biceps, and trapezoids. While your work on your all body muscles there will be no impact on your joints and knees. It also comes with a built-in 60 sec. recovery heart rate testing feature that will be a great help in your fat loss journey. The sensors on the handles act as the body fat percentage analyzer. You have the 4 goal specific target heart rate zones, heart rate beats per minute and age range that let you know whether you’re in your optimal heart rate zone. We don’t hesitate to recommend it as it offers decent value for the dollar.